Dear Reader, this web site is a non-profit initiative. It is free. It aims at helping You in making profitable stocks and shares transactions. Give as ... Every penny/cent counts and You can help. Hosting and developing a cloud based web site has costs. If you found this site of some interest, take a minute to help keeping it online and improve. Premium Markets is a free stocks and shares price trend prediction engine using neural networks. The stock market forecast is based on technical analysis of individual stocks or markets - see here - , as well as on sectors and markets indices rotation and stock markets performances - here - . In this other page you will find a summary of the former ran over stocks and shares within the main markets worldwide on a regular basis. This free trend forecast software ought to help you, as a stock market beginner or as an advanced investor, in stock market screening, performance projections, market analysis and ultimately in finding the best future stocks and shares for your swing or long term investments. Premium Markets also offers stocks buy sell signals monitoring via buy sell advice sent through email notifications. The stock market forecast engine is available as a free workable demo online and also as a standalone application. The latter including additional features like price historical data charting, price trend monitoring, financial technical analysis indicators and oscillators editing and managing stock portfolios. May Premium Markets be a free addition to your stock market watch and stock market trend analysis. 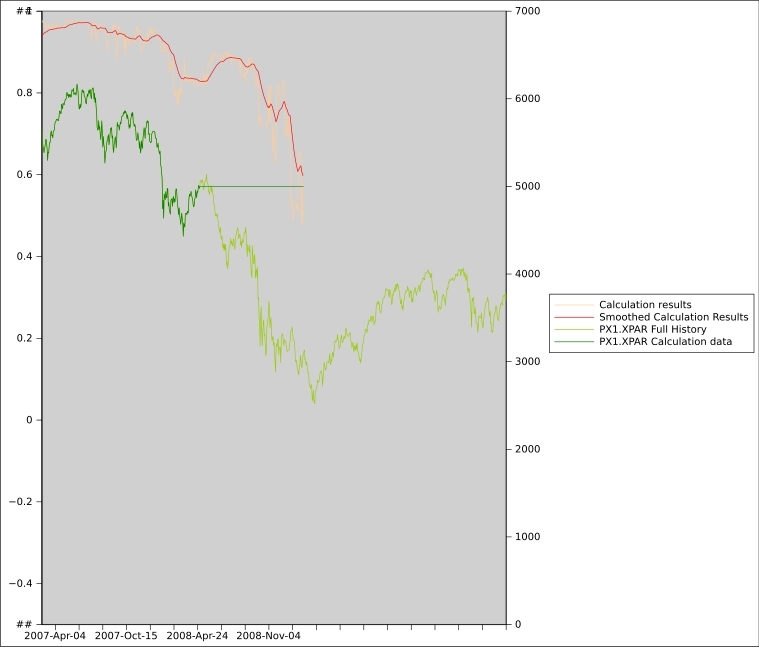 Premium Markets offers a forecast engine based on historical data analysis. Using daily historical quotation data, in its current version, it is build to help stock market beginners as well as advanced investors with swing trading and long term trading. The engine aims at finding what the next trend of a chosen market, a specific share or a set of shares will be. In other words if it is bullish or bearish. If the next price of a share may be impossible to predict in an accurate manner, it may, however, be possible to forecast the trend a share price will take in its near future. Knowing the trend, one can aim at buying near the lowest price and selling near the highest price over a defined period of time. The main issue faced using technical analysis is that it seems difficult to master without many experiments, back testing, practice, knowledge and as many failures. Difficult, indeed, to find out in an accurate manner what a signal or a set of signals really means regarding the trend a share price will follow. 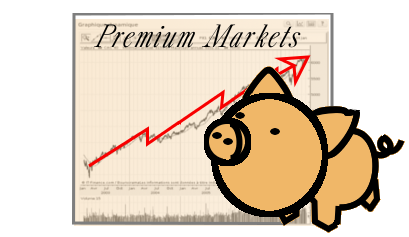 The Premium Markets forecast engine is here to try and answer this issue and give everybody the ability to use technical analysis without necessarily knowing that much about it. first, we analyse historical stock prices using a set of technical analysis indicators and oscillators and a set of arbitrary stocks. we define a desired output as a function of the historical stock prices in our set (this would usually be a SMA). we then use the analysis as input of a neural network engine (neuroph in this instance), having specified the desired output, in a process called training. when the training is done, we can use the resulting neural network and inject daily technical analysis results for any share or index as a new input. the neural network is then giving us the predicted output for this new stock and share. 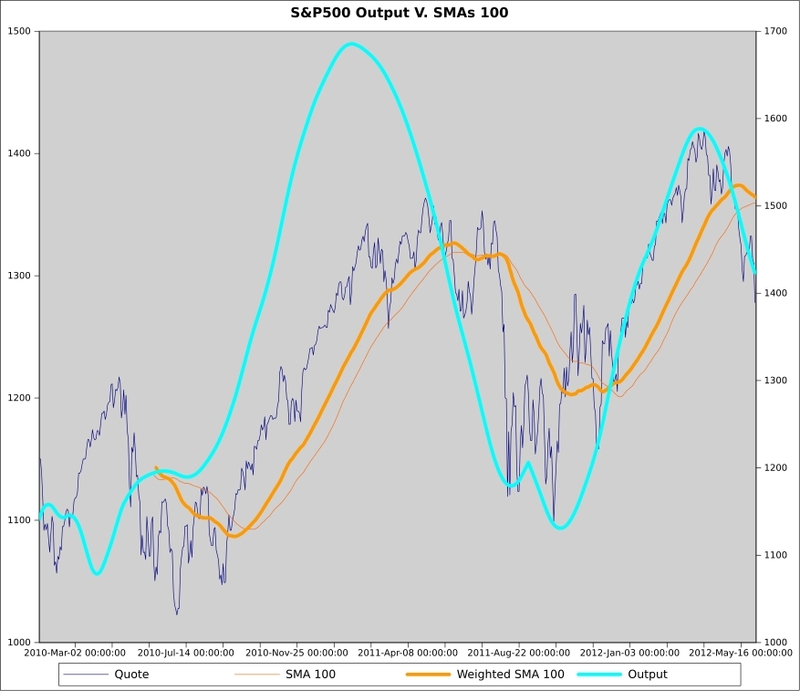 When back tested on historical data, the calculation results give us a curve similar to the desired output, in this instance, an SMA. The difference being that the real SMA is lagging behind the quotations making it unusable in a volatile market and our result is not. This is fairly amazing considering that we don't directly use the historical data as input like the SMA does but just signals generated from various indicators. Hence somehow we predict the future SMA of the stock price. 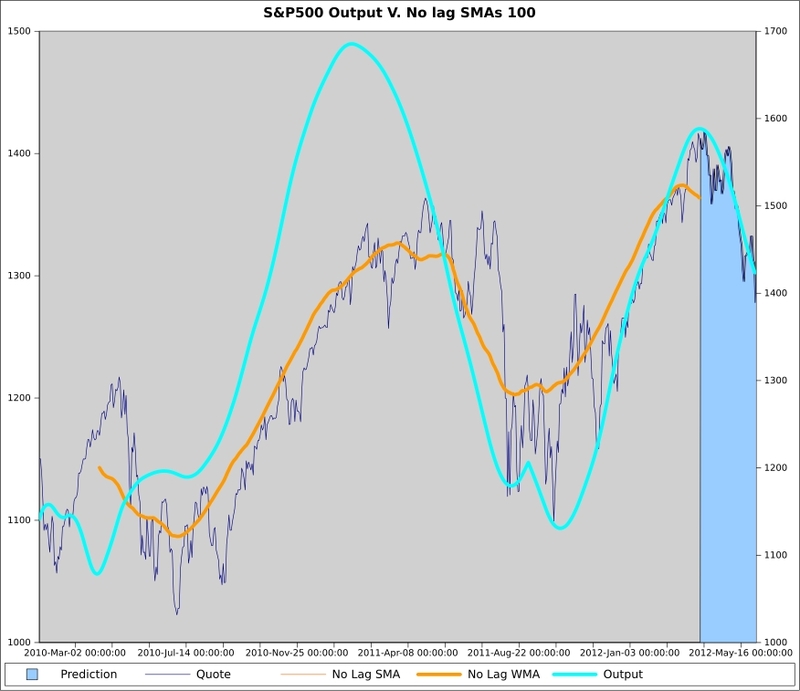 On the following charts we compare the neural calculation results on the S&P500 to the SMA and Weighted SMA 100 of the quotations data. The last quotation available at the time of this calculation is the 1rst of June 2012. The dark blue line is the quotation history and the light blue line is the trend line output issued after calculation. In orange are the SMA 100 and the Weighted SMA 100. As you can see, and this is a well know fact, both SMAs are lagging behind the real trend (of about 50 days which is half of the period). An SMA with a longer period will reveal a better price trend but will also increase the lag. 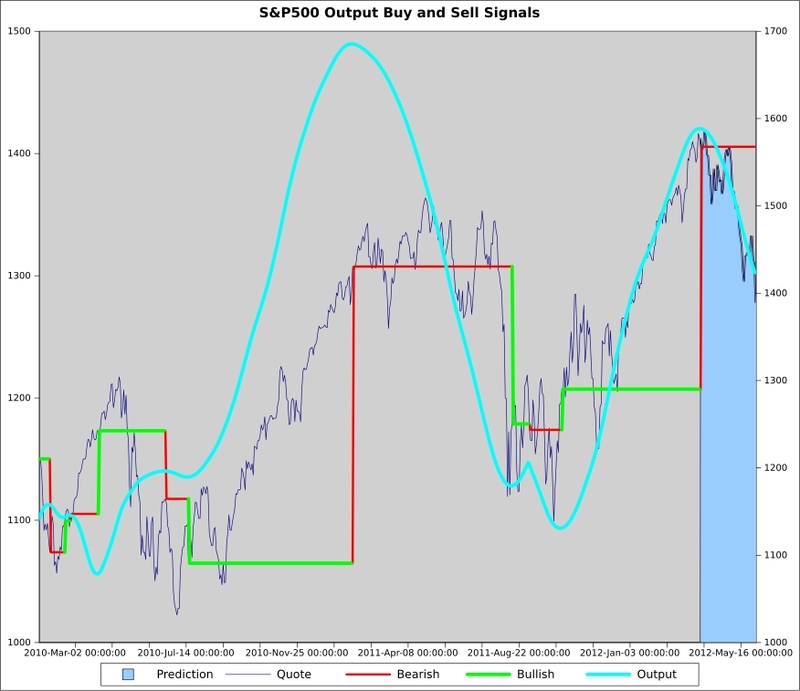 On the other hand a smaller period reduces the lag but also will be less smooth leading to bad signals. How can we square the circle? 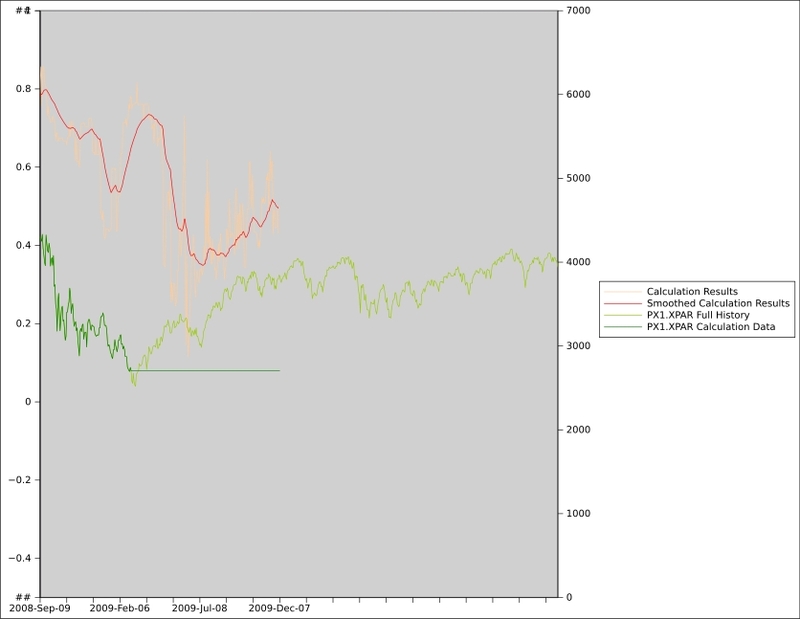 As you will see in the next chart, the neural output calculated by Premium Markets answers both of these issues. In that chart, we have 'fixed' the SMA lag by artificially shifting the Weighted SMA 50 days backward, letting the resulting SMA to display a better representation of the trend indeed. The issue is now that, in this case, we are missing the most important last 50 days of the trend as they have been shifted backward. It is represented by the light blue prediction area on the chart. The trend looks similar to the selected SMA as we know it, after fixing the lag. The generation of bad signals is hence mitigated with a smooth curve. But most of all the trend is drawn until the last day of quotation available. As seen above, the output is in fact drawing a smoothing line of the stock price trend but without the lag you would actually get with other smoothing techniques. By redrawing a smooth trend line of the quotation line, the output from the neural network will tell us if the share is following a bullish or a bearish trend. The green and red lines draw an interpretation of the trend line indicating respectively bullish and bearish trends. Here the interpretation is simply based on the trend line going up or down and its reversals used as buy and sell signals. It may be worse mentioning that a finer interpretation can be made for each stock. For instance considering the slop and velocity or adding some delay when reversal occurs. Premium Markets also offers an email notifications service for trend and market watch. For a preview and a usable free demo, developed as a proof of concept, have a look at Premium Markets Trend prediction on technical analysis and Premium Markets Global market trend watch. This feature is based on the sector rotation theory which in short aims at predicting stock markets trends based on price movements of sector indices. Following the same principle as for predictions based on technical analysis Premium Markets aims at forecasting the next trend of a share using historical data of these sectors indices and other major indicators. Again the historical data are injected into the neural network (neuroph) during a training phase. The latest data are then used to forecast the near future of a random stock of your choice. Here again, the aim is not to find the price value but more to predict the price trend. On the following charts, you can see two sample results of a back testing against the French CAC 40 index. The dark green line is part of the CAC quotations used for training and calculation. It respectively stops on May 2008 and February 2009 with a horizontal line. This horizontal line represents the period of prediction (200 calendar days on these samples). The light green line is the full quotation of the CAC. It is used here as a mean of comparison as it won't be used in the calculation, these being future data in the context of the back testing. The red line is a smoothed representation of the resulting forecast output. You can hence see the accuracy of the resulting forecast, over the 9 months of prediction, by comparing the red line to the light green one. For a preview and a usable free demo, developed as a proof of concept, follow Premium Markets Trend prediction on sector rotation. Premium Markets also offers a global trend watch and forecast ran daily over the main stocks and shares markets. This stock market prediction summary gives a global view of the markets and industries current and future trends. For a preview and a usable free demo, follow Premium Markets Global market trend watch. Premium Markets also offers a multi platform downloadable Standalone Application User Interface for portfolio management including historical data charting and technical analysis indicators monitoring. In its advanced version, the User Interface can also be used as an entry point to the forecasting engine. For more details and downloads, see Premium Markets at sourceforge.net and Premium Markets Standalone App.